Now the DISH smartbox, a ground-breaking new product with the ability to deliver flexibility, space saving, and energy efficiency and reliability from a single platform. 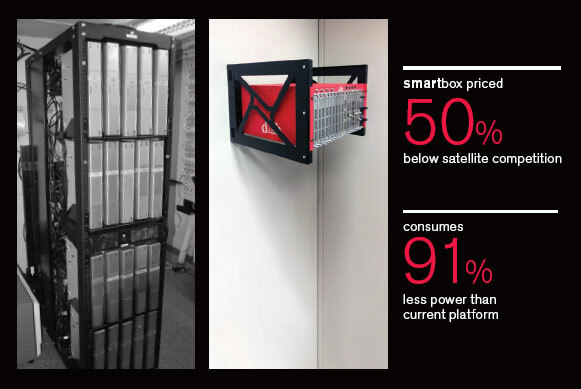 smartbox is designed to be a revolutionary product for use in bulk video distribution applications. However, smartbox is much more than a commercial satellite receiver; it is a highly integrated video distribution platform. Not only is smartbox designed from the ground up to operate continuously, it is designed to be highly flexible by providing multiple operating modes that can be enabled simultaneously. Signal reception – smartbox uses a single common set of assets to receive DISH satellite signals. The Satellite Receiver Blades then send TV channels or transponders to the backplane in the chassis for distribution by one or more Signal Output Blades. Signal output – multiple options for video output are available and can be configured in any combination because smartbox architecture has no inherent capacity limitations. 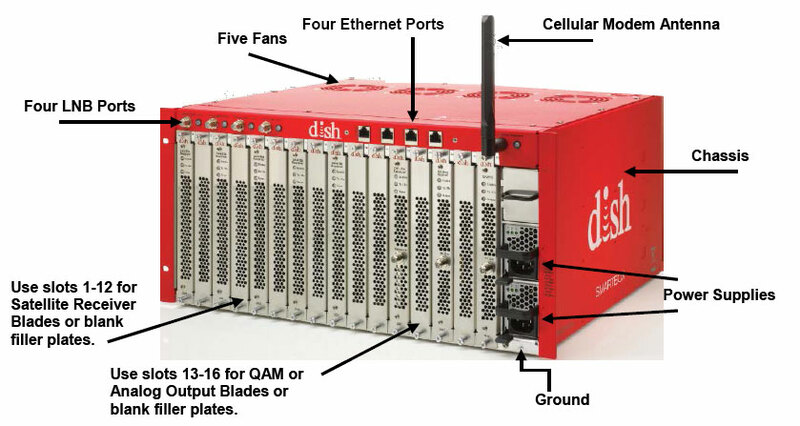 Operational modes – all operational modes must be activated by DISH Feature Enabling Codes or they will not function. The modular design of DISH smartbox, comprising multiple components, provides great configuration and installation flexibility. Please see the illustration above for the location of key components. The chassis replaces all multi-switches, most cables and communicates with the DISH Network Operations Center through the 3G cellular modem. Five large, top-mounted fans pull cool air through the front panel to provide integrated cooling to the system, improving reliability – without the need for an expensive, climate-controlled environment. Four LNB Ports – satellite input (three ports for Eastern Arc or Western Arc and one port for International programming). Four Ethernet Data Ports – the first data port is for user management; the second, third and fourth data ports are for video input (property-generated content) or video output. Cellular Modem Antenna sends signals to the DISH Network Operations Center so DISH and the Retailer may monitor and manage the system in real time. Fully redundant power supply delivers 600 watts of power; energy costs are a fraction of traditional headend systems. - Satellite Receiver Blade – eight tuners provide eight channels of TV service per blade. Up to 12 blades may be installed in a single smartbox for 96 total channels. Each blade has two Smart Cards and two ProCams which are authorized in the same manner as a normal DISH receiver. - Advanced TV Systems Committee (ATSC) Receiver Blade (not pictured) – provides up to eight off-air local TV stations. - Transcoder Module – may be added to a Satellite receiver blade, if needed, for certain output modes such as conversion to MPEG2 for HD-Over-Coax installations and servicing MPEG-2-only TVs. - Quadrature Amplitude Modulation (QAM) Output Blade – as a modulation format used to deliver digital content over coax, QAM will output digital streams over a completely agile QAM carrier, with options for attenuating output. DRM encoding can be added as needed per location and TV type application. - Analog Output Blade – outputs an Analog Audio/Video signal that can be used with all Analog-capable TVs. This output acts in the same manner as our current analog headend. Because different property types have varying programming constraints, smartbox offers the ultimate in flexibility by providing multiple modes which can be enabled simultaneously. Pro:Idiom® – video encryption technology used by the hospitality industry to protect HD content in hotels. A smartbox will encrypt the video with Pro:Idiom and TV or set back box will decrypt the signal in the room at the TV. Verimatrix Video Content Authority System™ (VCAS) – the U.S. hotel industry has adopted this encryption technology primarily for video on demand (VOD). To keep licensing costs lower, VCAS is used for FTG programming that is used for VOD property wide. A smartbox will encrypt the audio/video programming in VCAS and the TV or set back box will decode the video in the room at the TV. An additional Key Server will be needed since only the VCAS encryption is implemented in the smartbox. HD Over Coax – using existing coaxial wiring, this transcoding technology allows analog HD video to be converted to digital video. This method contains no encryption, but does provide watermarking. Certain content or property types, such as Premium channels and hotels, are not approved for this type of content distribution. Digital Upgrade (DISH QAM) – similar to current QAM methods, the smartbox receives the satellite signal and simply passes it through a QAM carrier without decrypting. At the TV, a QAM-capable DISH receiver decrypts the video for display on the TV. Analog – Dish smartbox can function as an analog headend and replace today’s SMATV headends by receiving, modulating and distributing between eight and 72 channels of video and outputting RF over the coax distribution system. QAM – DRM is used in conjunction with QAM to protect the content being delivered. IP Network – using this video distribution method in conjunction with DRM protects the audio/video content being delivered.